NOTE: I'm reprinting this article from my old blog which means unfortunately a lot of links are dead. Especially the store to buy the book so I'm removing all of the links. I suppose there is a place out there for a designer who does nothing but dream up great ideas that some one else gets to implement but every designer I know spends all of their time going over the fine details of a problem. No matter how simple or complex the problem is or the solution what you are really dealing with is the details of all that. One of the reasons why I love Street Fighter so much is their ability to pay attention to these small details. Granted Sega probably does it better these days with Virtua Fighter but Capcom used to be the leader of it all. You have to be especially when you are creating games that people are playing against one another. Overlooking one small detail makes a character completely broken and if not caught in time can completely ruin a game (see Tekken 4 as an example). When releasing various versious of Street Fighter over the years Capcom usually tweaks the characters in efforts to fix problems from before. I hate to say balance but thats the best word I can come up with. Moving on I still find it interesting as to what Capcom decides to tweak going from one version to another. I recently picked up the Yoga Hyper Book which I HIGHLY recommend to anyone interested in Street Fighter nuances like hit boxes and frame data. You can order it here. 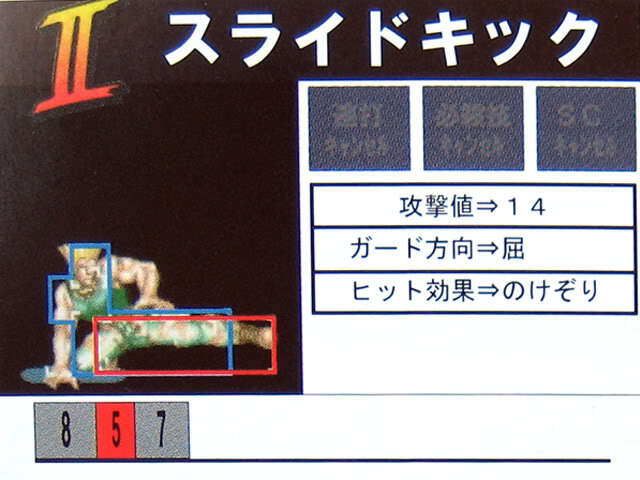 While only really covering Super Turbo they have a few pages showing the hit boxes/frames for 'important' moves from World Warrior (the 1st version of Street Fighter 2) to Super Street Fighter 2 Turbo (the 5th and final version to actually be called Street Fighter 2). One of the more annoying moves in that game happens to be Guile's Low Foward (it's a low hitting move that comes out really fast, has great range and quick recovery) which in the hands of great players like John Choi can win an entire tournament alone. The book includes pictures of hitboxes/frame data for Guile's Low Forward for all 5 games so I'm going to post each one and give comments for them. Notice the blue area goes around his arm and where it stops - before the boot. Notice how the red area stops at the end of the boot. This move was incredible in World Warrior and it is easy to see why - his whole leg is a gigantic hit box! The startup, hit frames and recovery are all the same. But notice how the blue and red boxes get shifted around. Guile now gets the ability to be hit in the back of the move as well as a little closer to his boot. However - the red box (the hit box) gets pushed out a little more than the graphic indicates. This was their first attempt at balancing the move out. An interesting choice of decisions. Capcom was taking a while to come out with another sequel (which would be Super Street Fighter 2 featuring once again 4 new characters) so in the meanwhile urban legend has it that 2 American designers (James Goddard and Dave Winstead) came into to release a minor update to combat all the bootleg rom versions that were coming out (such as Rainbow Edition where you could do all of your moves in the air). This version alone I could probably write a whole article on as it features not one single new frame of animation yet the game was tweaked and is considered by some to best version of Street Fighter. It is also the one that is coming out soon for Xbox Live Arcade (some day...). For their 2nd attempt at trying to figure out what to do with this move it looks like they left it completely alone from Champion Edition but toned down how much damage it does to the opponent (from 14 to 10 points). Keep in mind that many people consider Guile to be the best in not only World Warrior but also Champion Edition and Hyper Fighting. They brought the damage back up from 10 to 14 but they also added a frame of recovery. Notice the red box and how it gets pushed back inside Guile, no longer going past the graphic of his leg arguably having the shortest attack range out of all versions. This also happens to be the first game where Guile is not considered one of the best. Another sequel but this time they brought the speed of HF back along with a ton of small changes. However it looks like they decided to leave Guile's Low Forward the same as it was in SSF2. Small changes can have very huge effects throughout your game. Simply adding one extra frame of recovery can alter how a character can compete. Granted there are way more variables than just this one move but thats just it - you need to keep track of them all and realize how they all interweave and what impact they have upon one another. Even if you aren't making a sequel or a competitive game you should still try to keep everything in mind, one small error can result in an infinite combo or getting the character stuck in an animation loop because the exit frame is longer than the animation itself. Hopefully this wasn't too boring or too Street Fighter-centric but I felt more comfortable using SF as an example to convey the larger topic since I know that game better than most games. Note: Images hella used without permission. Sorry Daigo.